After Typhoon Haiyan struck the Philippines last November, the United States government made a vast amount of DigitalGlobe imagery available to the public for humanitarian purposes. You can find this free imagery on ArcGIS Online through the DigitalGlobe FirstLook Premium Services. The service has many benefits for first responders and humanitarian workers. It’s constantly updated, providing access to all the images from the start of the disaster to the recovery phase. This empowers the user to map change, assist with emergency planning, and help with disaster recovery. You can use the service on ArcGIS for Desktop, ArcGIS for Server, ArcGIS Online, or anywhere else on the ArcGIS platform. This tip shows you how to connect to these feeds using ArcMap. Note: If you don’t have an Esri Global Account, you’ll have to create one to proceed. Sign up here. (You may already have an account that’s part of an ArcGIS Online organization. You can use that account.) 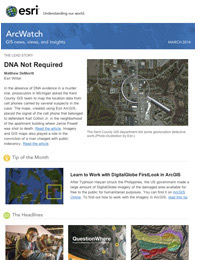 You are not required to be part of an ArcGIS Online organization to use these services. 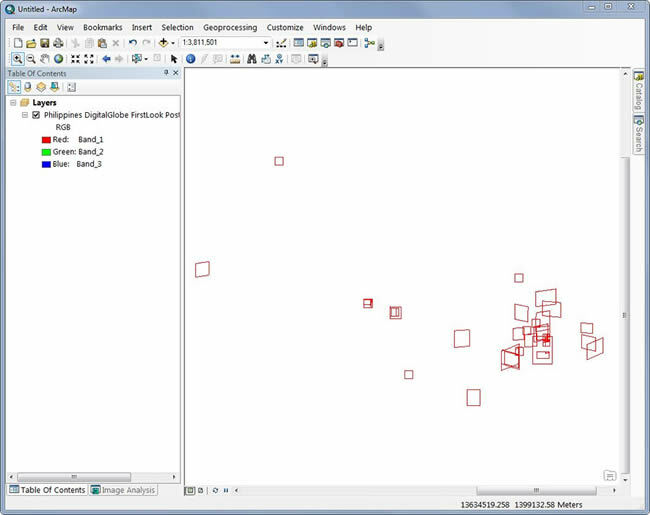 Step One: Load FirstLook into ArcMap. 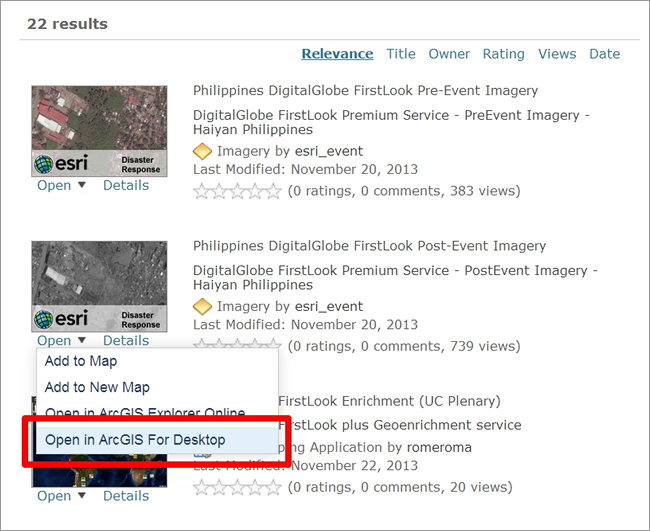 DigitalGlobe FirstLook pre- and postevent services are listed in ArcGIS Online. 4. Choose one of the services you’re interested in, click the small arrow next to Open, and then click Open in ArcGIS 10.2 for Desktop. Services listed in ArcGIS Online can be added directly to ArcMap with just one click. This will download a Portal for ArcGIS item to your browser download folder called item.pitem. 5. Double-click the file to open it in ArcMap. You may be prompted to sign in to your ArcGIS Online account from your ArcMap session if you’re not already signed in. “The service will be available in the table of contents (TOC), but you will see only the wireframes (red outlines of the imagery) because the imagery is loaded at the full extent. The imagery will be displayed only when zoomed in below 1:800,000. Step Two: Display the footprint for each image in the image service. This step will help you visualize all the images that are part of the image service. Right-click the layer in the TOC and select Properties. In the properties dialog box, select the Display tab. 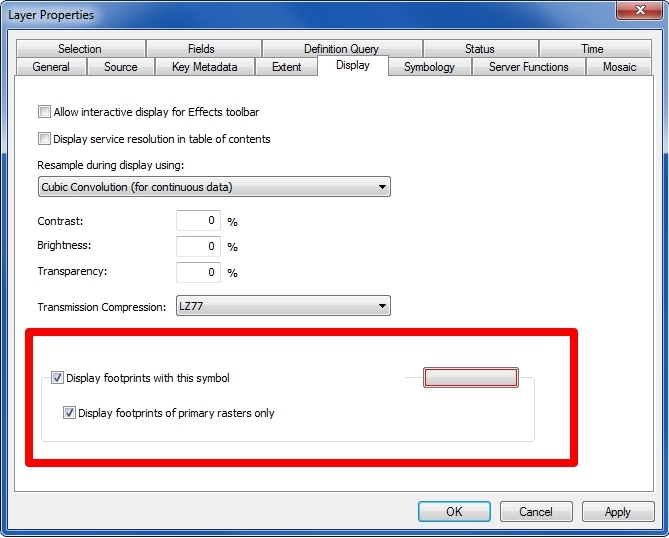 You can use image services to display the footprints and modify other display characteristics in ArcMap. The footprints for the service should now appear in your data frame. Each polygon in the map represents an individual image. Displaying the footprints in ArcMap is a good way to see where all the images are located. 4. On the Tools toobar, click the Add Data drop-down menu and click Add Basemap. 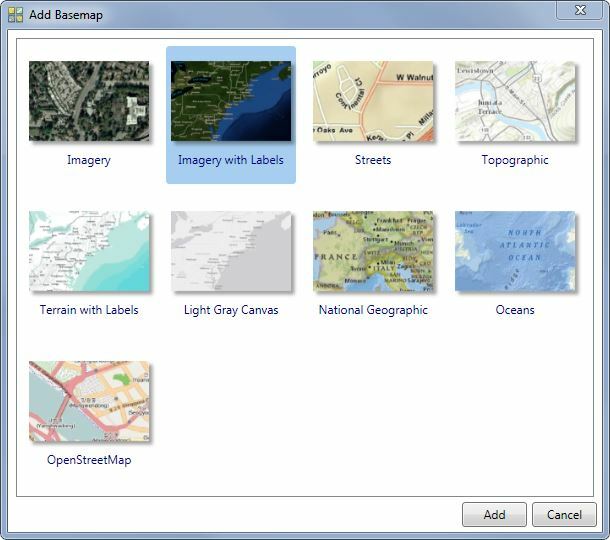 Basemaps from ArcGIS Online, accessible from ArcMap, provide context to your exising geographic information system (GIS) data. Zoom in to a collection of images to see the imagery. They’ll draw around a scale of 1:800,000. Step Three: Apply a definition query on the image service to filter by sensor. This FirstLook service contains images from WorldView-2, WorldView-1, and QuickBird. In this step, you will apply a filter to see only imagery from WorldView-2. Go back into the layer properties and click the Definition Query tab. FirstLook image services let you display imagery by sensor.Your map should now contain only images from the WorldView-2 sensor. Step Four: Group images and organize by date. Since this FirstLook service is constantly being updated with new images, there are many scenes stacked on top of each other. This is not always the best way to visualize the imagery. Luckily, the FirstLook service contains all the metadata associated with each scene. ArcMap contains tools to help you better visualize the imagery based on the metadata. In the steps below, you will learn to group the images by date and visualize the scenes over Tacloban City, which was one of the areas hit hard by the typhoon. 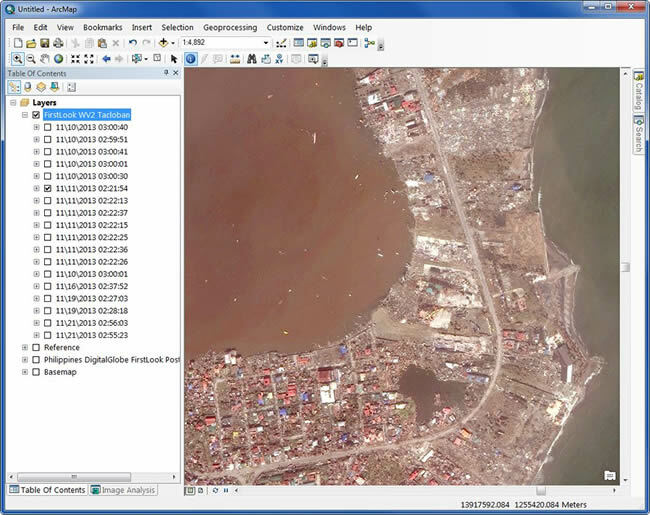 Zoom in to Tacloban City where there’s a high concentration of imagery. See the screen shot (below) to find the area of interest. After you zoom in, use the Select Features tool on the Tools toolbar and select all the scenes in the data frame. Right-click the layer in the table of contents and choose Selection > Add Selected Rasters to Map. 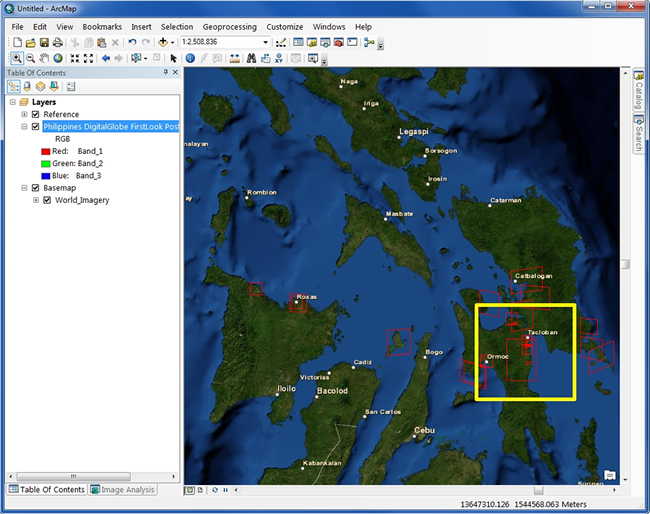 In the dialog box that appears, give the group a name, such as FirstLook WV2 Tacloban. On the Layer name based on drop-down menu, select AcquisitionDate for the Layer Name and click OK.
You’ll now have a separate group layer with all the individual scenes listed by date, starting with the earliest. Tip: To collapse all the scenes in the group layer, hold the Ctrl button on your keyboard, then click the minus sign next to one of the images. This will shorten your group layer list for better organization. Suggestion: Hold the Alt button on the keyboard, then click the check box next to the layer to turn images on one at a time. Go down the list of images to visualize the images with no overlap. Optionally, right-click the new group and save it as a layer file to reuse. Go back and change the query definition in the layer properties to visualize other sensors or combinations of sensors. Save your favorite query definitions as layer files to save time in the future. The full DigitalGlobe Premium Services are now part of Esri ArcGIS Marketplace and can be purchased as a subscription. Other DigitalGlobe Premium Services include the Global Basemap, which provides global coverage of current, high-resolution imagery. Also available is the Multispectral service, which provides 8-band, 50 cm imagery and can be used for analysis.